In an attempt to feel more summery and healthy despite the lack of visible summer, I have been making lots of salads. 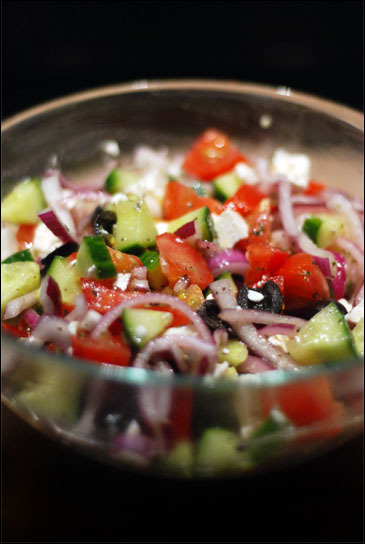 Greek salad is excellent because it’s really quick to make and is deliciously refreshing, especially when served with plenty of fresh bread to mop up all the gorgeous juices. I learned a wonderful trick from Turkish au pair I had when I was about 12, who always soaked the onion slices in lukewarm, salted water to draw out some of the pungency, and it makes all the difference. Chop the tomatoes into chunks, removing the slightly woody part at the top, then chop the cucumber into cubes and put into a large bowl with the tomatoes. Slice the onions, then soak them in lukewarm salted water for 10 minutes. Just before you rinse and drain the onions, gently squeeze them in the water, and then set aside to drain. Add the drained onion, the olives and the olive oil, lemon juice, oregano, salt and pepper and mix in until evenly distributed. Finally, crumble the feta on top, gently stir into the salad and serve.